Crews in La Broquerie, Man. are slicking the streets and sidewalks with beet juice and brine in an effort to save money and the environment. The rural municipality was getting tired of the cost and cleaning up sand from the roads every spring, so this winter, they switched to spreading a sugar beet-based cocktail called Fusion 60/40 on the streets. 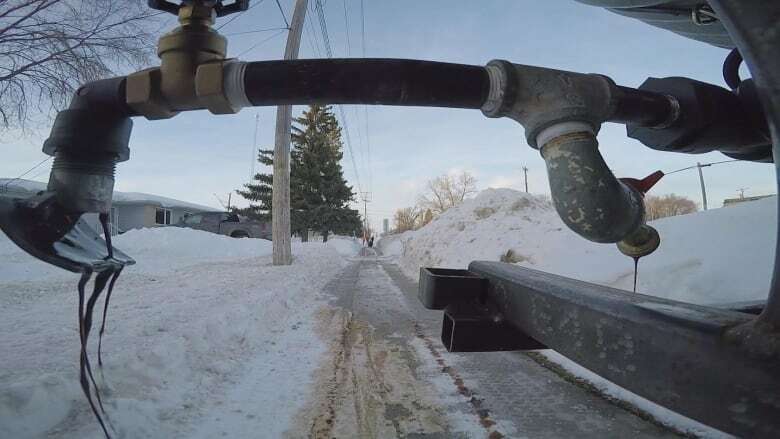 "It's eco-friendly and it works well, and it's also good on the pavement, it doesn't destroy the pavement like the conventional methods we used to use," said Ron Kowalchuk, public works supervisor for La Broquerie. That salt-sand mixture of the past will no longer be collecting against the curbs. Instead, on warmer winter days, contractors spread the juice. The concoction is comprised of 60 per cent beet juice, 30 per cent water and 10 per cent salt. Once the de-icing truck applies the solution to the road via two "spray bars," the rust-coloured mixture spreads across the surface of the road and dries. When the weather cools, the beet juice is already bonded to the road, preventing the slippery ice and snow from doing the same. "It's made from just sugar beets," said Jeff Gulyas, sales and marketing manager for Collet Transport, which distributes the product. Beet juice and cheese brine: Halifax's solution to icy roads? The beet juice is made in Notre Dame, Man. using sugar beets brought in from the United States. "They go through a process, we get the raffinate afterwards, we put it into a process with our brine, then that turns it into a liquid and that's what's going down onto roads and sidewalks," said Gulyas. "Raffinate" refers to the material left over after impurities and certain other components have been removed. The beet-brine mixture is less corrosive than past salt-sand mixtures and gentler on plants surrounding the roads. The beet-based products are also being used in Dauphin, Man., and on roads and sidewalks at the Assiniboine Park Zoo. "It's got a slight odour to it, it's non-staining, but it looks like coffee, smells like molasses," said Jeff Friesen, operations manager at Unger Excavating, the contractor spreading the product in La Broquerie. He's also been spreading sand mixed with beet juice on the roads in La Broquerie. While the beet juice is preventative against the ice and snow, the beet-sand is more "reactive," he said. "It's evident it's being effective because it doesn't blow where it is and stays where it is," Friesen said. The beet juice is slightly more expensive than the salt-sand mixture, but Kowalchuk said it will cut costs in the long run. "It's going to save money in the end, there's going to be less need for the product because it'll last longer on the road, it sticks to the road," said Kowalchuk. He's looking forward to a breezy sand cleanup in the spring. "I think for the cost difference we're well ahead of the game," he said.